Want to drink with Han Solo? 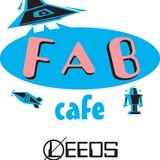 If you're looking for a bar which is slightly out of the ordinary, then the Fab Café could be the place for you! Calling itself the world's first cult TV and movie bar, the Café is host to a huge menagerie of cult references: Han Solo rests against the wall in carbonite, Darth Maul waits in the shadows near the arcade machines, and an alien parasite lurks behind glass. Established in 1998, the bar is located on Woodhouse Road, underneath the big Morrisons in the Merrion Centre. It looks fairly inconspicuous, with only a logo outside the door, but once inside you will be bathed in the fantastic atmosphere and awash in a sea of cultural references. The bar has daily specials, including pub quizzes. On Wednesday nights the bar hosts a themed pub quiz, dependent on current events (for example, in August they had a Yorkshire-themed round to celebrate Yorkshire Day), and on Sundays they host the Super Nerd Pub Quiz, where all the questions are dependent on a sound knowledge of films, television and gaming... and the prize is a gallon of beer! As well as discounting drinks on certain days, the bar sells a selection of retro sweets. Although somewhat dearer than the conventional pub, the Fab Café has an amazing atmosphere and awesome events that leave you wanting to return time and time again. I would highly recommend it if you enjoy cult films and fun times! Why? Fancy going to a bar with a difference?